Radiant Blinds recovered the existing awning on this restaurant. The framework was dismantled and brought back to our works so it could be powder coated to RAL spec. A new cover was manufactured in our factory in red acrylic with a matching valance which was signwritten. The overhauling of this existing awning provided an updated look without incurring substantial costs for the client. Tortilla restaurants are not part of a franchise and they are passionate about making great quality‚ fresh and delicious burritos and tacos. Check out their website for more details on their food and menus. 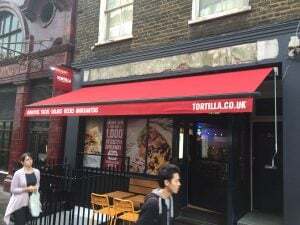 Radiant Blinds is proud to be working with Tortiall and helping to promote their restaurants through the installation of eye-catching awnings.